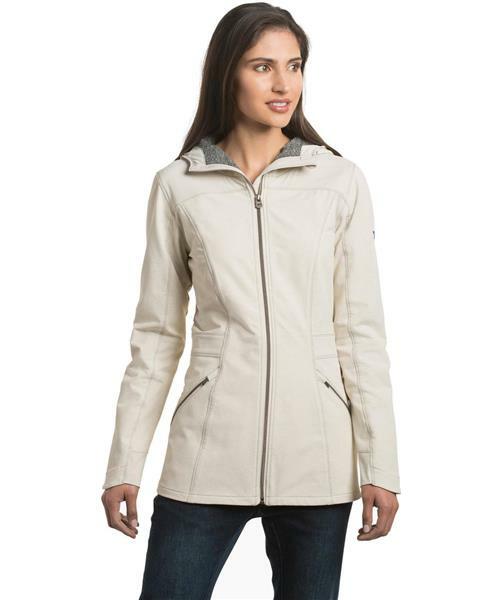 The KÜHL Women's Klash™ Trench features durable FLEXWÜRX™ brushed softshell fabric with a unique 2-tone weave, added abrasion resistance, and DWR finish for year-round performance. The softshell fabric withstands 50K rubs to pass the Martindale abrasion test. The soft, brushed back provides superior comfort and warmth. Strategically placed Tufflex™ overlay on yoke provides extra protection from the elements. A durable, woven stretch softshell, Tufflex has a brushed back, repels water, and dries quickly with DWR. KÜHL's signature hood design features front and back cordlock adjustments for a custom fit. Spacious hand pockets provide ample storage, while metallic center front and hand pocket zippers create an urban look. Stretch cuffs are built-in for less bulk. Center front zipper falls to mid thigh (30").